I joined Bekkerman Law Offices, a Plaintiff’s personal injury law firm founded by my husband Gerald Bekkerman, after five years of practicing complex commercial litigation defense at Winston & Strawn LLP, where my practice focused on pharmaceutical products liability, antitrust, federal regulatory compliance, and white collar criminal defense. Bekkerman Law Offices is a boutique law firm focusing exclusively on representing those injured due to the negligence of others. We specialize in significant damages cases, involving anything from automobile and truck accidents, to nursing home neglect, medical malpractice, product liability, and work injuries. My current practice centers on our most complex cases, concentrating on cross examining medical experts, trial preparation and procedure, and pre-trial, post-trial and appellate motion practice. Why you are a member of the WBAI? I am a member of the WBAI for two reasons. The first is strictly personal. This organization provides an incredible community of successful, driven, and supportive women who have become mentors and friends. I look forward to every event where I get to laugh with and learn from our members. The second is global. 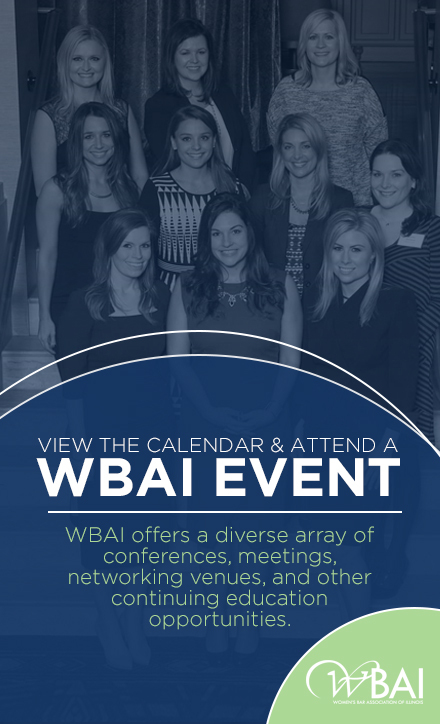 From its inception, the mission of the WBAI has been to promote and support women lawyers. I believe the justice system as a whole is better when women have leadership roles across the board – from the bench to the board room, from the defense bar to the plaintiff’s bar, from the prosecutor’s office to the public defender. I have witnessed this organization encourage and support women to obtain leadership positions in every facet of the Chicago legal community. I am honored to be a small part of helping our fellow women lawyers accomplish their leadership goals, which only betters the administration of justice for our community as a whole. What you are most looking forward to this fall? I am looking forward to a number of events for our newest membership initiative “Legally Mom,” including panels on the topics of negotiating flex schedules or alternative legal careers and securing the best education possible for your children, as well as some informal get togethers (coffee, happy hours, lunches) and a holiday volunteer opportunity. Also, the Top Women Lawyers in Leadership Awards Reception is a favorite of mine because the talented and tenacious women honored at the inaugural event (and the ones who planned it) are truly the reason I joined the WBAI in the first place. Hope to see you all there! Before law school, I earned my BFA in Theatre Acting at the University of Illinois, and I still get my theatre kick every month or so at any one of Chicago’s incredible theatres like The Goodman, Steppenwolf, or Second City, to name a few. My husband already thinks our two year old son, Cameron, has inherited my flair for the dramatic based on his rousing renditions of “Twinkle, Twinkle Little Star.” Only time will tell!